Localrootz Project: LocalrootZ Project 2010 Retrospect ! 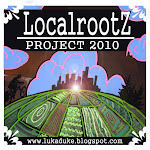 LocalrootZ Project 2010 Retrospect ! What an amazing year ! Awesome! I've recently shifted more of my families diet locally also and find it easier than I thought- although we're probably at closer to 40%. Inspiring to see your progress and the creativity you brought to meals (ingredients & presentation). Beautiful, bravo! hey there Luke (and Cassi)!! I just read the article in 'The Portland Press Herald' about your eating locally project. Terrific! - and congrats on the article. I was sent the link via a couple of friends in Maine who I think you may want to meet. James Lindenschmidt makes mead ... and his wife, Lisa Marie, makes incredible chocolate ... her biz is 'Rite Chocolate' ... you can find both them on facebook or through LM's website. Also, Frank Giglio is another Maine source ... he has an herb company, 'Frank's Finest' ... also a well-known chef. Anyway, good luck with your journey. Way to go!